marching band...wow, haven't been to a band contest since...well, probably my junior year of high school. one thing i have the privilege of doing with my position as youth minister is going to the young people's activities. last weekend i went to the avon band invitational. can i just say wow again! being there brought back so many memories. i truly enjoyed watching the young people from my church perform (and win their class) and walking down memory lane. ok, so i am back in a pool. on monday i went to the iupui natatorium, bought a 40-visit pass, and started swimming. i'm loving it. not quite the same as the outdoor pool in leichhardt, but definitely cool to swim in a pool that so many amazing swimmers have swam and broken records in. my name is marianne. 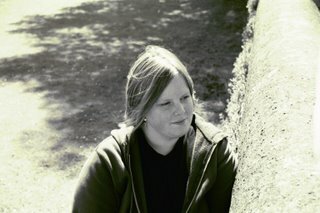 i am a christian, artist, youthworker, aunt, sister, daughter, granddaughter, friend, swimmer, reader, traveler, water lover, sports enthusiast, filmmaker, race car watcher, photographer, bike rider(cyclist, not harley), knitter, potter, weaver, dreamer, writer, opinionated person, movie and tv watcher, baker, music lover...i am a unique creation of god...so are you.